Jimmy Carter is a man of faith, integrity, and experience in negotiating peace in the Middle East. It has been decades since he was President, and he could easily retire, but he remains passionately engaged in the political debate. This documentary from Jonathan Demme follows Carter on his recent book tour to promote "Palestine: Peace Not Apartheid", a book that provoked controversy simply for drawing a parallel between South Africa and Israel. The documentary is on one level a portrait of Jimmy Carter, but it's a lot more than that too. It's telling to see a man making a sophisticated argument confront a media machine used to glib sound-bites and Manichean positions. It's also telling to see the sort of ire he attracts for daring to criticise Israel. It's pretty tragic to seen fine minds spend their hours crawling through transcripts to find any hint of prejudice rather than engaging with the macro arguments. 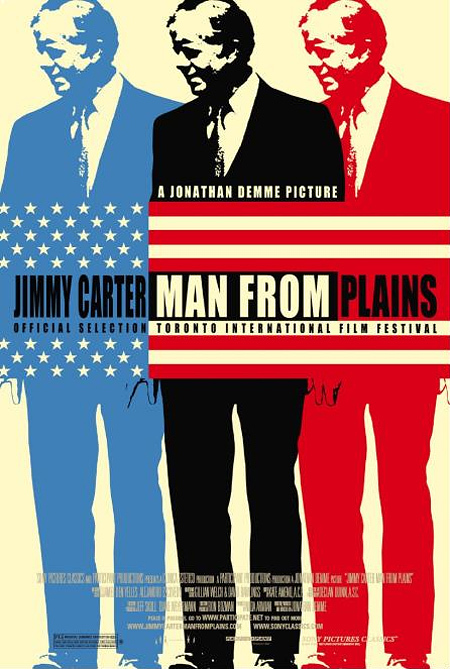 JIMMY CARTER MAN FROM THE PLAINS played Toronto and Venice 2007, where it won the Biografilm award, the EIUC award and the FIPRESCI prize. It went on limited release in the US in October 2007. It went on limited release in the UK in August 2008 and is now available on DVD.